Each individual ministry or department of government plays a role in the health of the population. 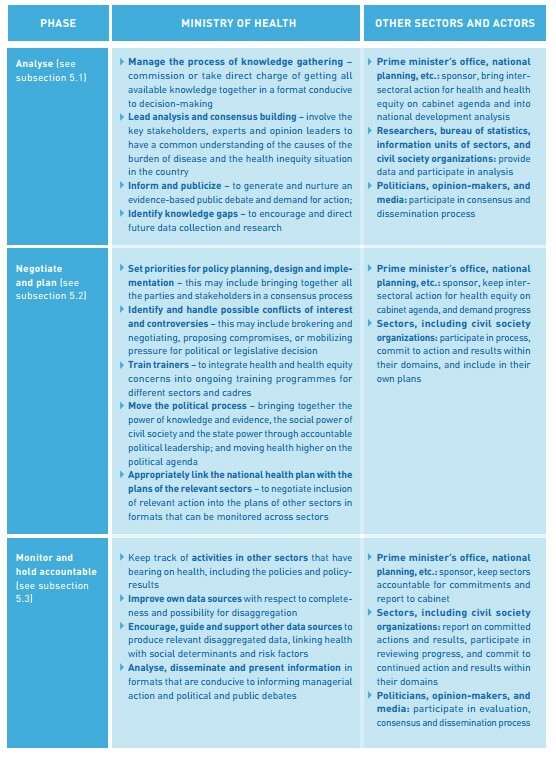 Improving health may not be the main objective of the sectoral ministry, but population health will be influenced by the decisions and policies made by each arm of government. It is important therefore to engage with ministries of health to understand how your actions are impacting population health – positively or negatively. For example, by increasing employment, you may also be increasing the sale of alcohol products and alcohol addiction rates in children. By not having a focus on health literacy in education curricula, you may raise a generation of teenagers and adults who are ill-equipped to deal with health challenges. On the other hand, healthier children and adults and better learners and more productive members of society. With the aid of the health experts, sectoral actors can use a health lens: assessing impacts of policies and services; giving visibility and legitimacy to health; empowering the marginalized; increasing collaboration and more efficient use of resources; and ensuring the sustainability of governmental work to promote well-being of people and the planet.